Thanks to all those who urged their national standards body to appeal the decision. Another article has just been published about South Africa’s appeal, so it might be a good read for the uninitiated. It also contains some additional background information. Since ISO approved OOXML as a standard, Microsoft has said it will also ensure that rival file formats work just as well in Office 2007, and that documents saved in the Office 2007 format will work smoothly with competing programs. 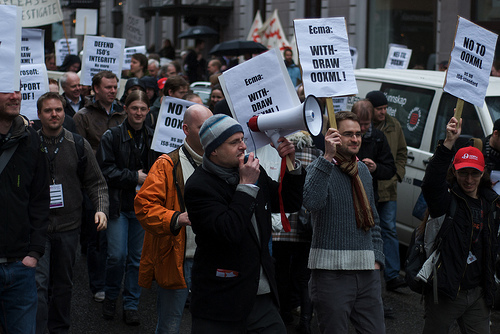 Opponents say OOXML still locks out competitors and perpetuates Microsoft’s programs’ massive market share. Microsoft declined to comment on the complaint Wednesday. There’s still some confusion about the appeal from Brazil, so we’ll keep you informed. Some say that Brazil did not formally appeal (ambiguity). We shall wait and see. Some days ago we wrote about Microsoft's fierce attack against some people in India. Now it’s a little clearer why it happened. The story wasn’t over in that nation, despite the inevitability of a “No” vote. India has just appealed, just like South Africa. The following article also seemingly confirms that Brazil formally appealed. India and Brazil have filed appeals against the adoption of the Microsoft-sponsored Office Open XML (OOXML) document format as an international standard. The world’s second- and third-largest populations protesting against the ISO process is nothing to sneeze at. It’s looking bad for Microsoft and ISO. There might be more appeals on their way. We hope that Malaysia will join the three we already know of. Malaysia issued a press release to sort of denounce the BRM shortly after it was over. Having just taken a glance at the Open Malaysia blog, there’s nothing new to see there. W00t !! OOXML just got PWNED ! I believe that’s it for appeals by the deadline (yesterday), so Malaysia is probably too late. I’m optimistically assuming that some filings were not announced. This does happen (same with final votes on OOXML back at the end of March). @David: in all likelihood, any appeals received by next Monday will also be accepted. “The Associação Brasileira de Normas Técnicas (ABNT), as a P member of ISO/IEC/JTC1/SC34, would like to present, to ISO/IEC/JTC1 and ISO/IEC/JTC1/SC34, this appeal for reconsideration of the ISO/IEC DIS 29500 final result.